Parents need to be aware that parking in the wrong place can be dangerous and expensive. 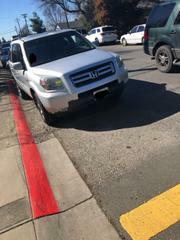 Parking in a red zone near a crosswalk is dangerous. It obscures the visibility of pedestrians entering the crosswalk and reduces the reaction time of drivers. Please pay attention to the crossing guards, the markings on the roadways and sidewalks and always drive with extreme caution around our schools. This particular vehicle received a parking citation that includes a hefty fine. Drive safely and park safely.